... where you'll find links to places and articles I've used during research. Thanks for your patience while we're still under construction! Where the story took place--the middle Shenandoah Valley, on the Great Wagon Road, near colonial Staunton, Virginia. What is a wagonmaster? Much about this story I drew from the diary of real-life colonial wagonmaster William S. Alexander, who worked the Great Wagon Road [different link from above] from Charlotte, North Carolina, up to Philadelphia. Quite the haul in its day. Why oxen and not horses? And, the handling of colonial oxen, with this fun article about oxen at Colonial Williamsburg. 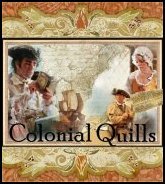 What purpose did the colonial "ordinary" (inn) or tavern serve, and what's the difference? Waddell's Annals of Augusta County, Virginia--an invaluable resource for local history and flavor. I could write a dozen stories inspired by this alone! What kind of stories of Indian attack might Truth have grown up hearing? **Truth and her immediate family--father, mother, and siblings--are fictional, but I anchored her story within the real-life Bledsoes of North Carolina and Tennessee. Information about them was often sketchy and inconsistent, but I did my best to piece together names, dates, and places in a way that made sense for the framework of my story. The family was more extensive than I was able to cover in a novella, but I hope I've honored their memory. Also!! Truth's little brother Thomas returns in his own story, The Cumberland Bride, coming October 1, 2018!